Kids are naturally attracted to bold and colorful books. If the front cover has a striking image, kids will flip open the book and explore its contents. This is why my family likes the DK Findout books. These books are a new series of DK resource books that are loaded with amazing illustrations and images, offer fun and interesting quizzes, and up to date information kids aspire to know. The Findout Books feature a variety of topics from science to space to animals to castles to ancient cities. Each book is captivating and filled with interesting facts, myth busters, and surprising stuff you never knew. Here are a few books that my family really like. Arr Matey! All swashbuckling hands on deck! Kids will get a kick out of the cool facts about pirates and their dangerous life on the high seas. With a mangy and brutal crew, they plague the oceans in search of treasure. Kids will learn about the careers of some of the most notorious pirates including females. 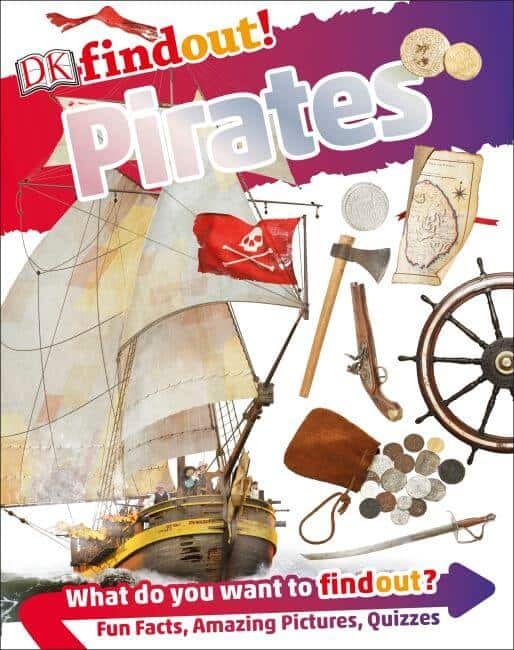 You’ll also learn about the loot they scored, buried treasure, treasure maps, the rules they followed, the fleets they manned, the punishment they endured if caught and so much more! Plus see real images of swords, cannons, pistols, coins, and pirates flags. Vikings were Norse seafaring adventurers and fierce warriors. Their land became overcrowded so they set sail on long voyages to raid other countries and establish new settlements. 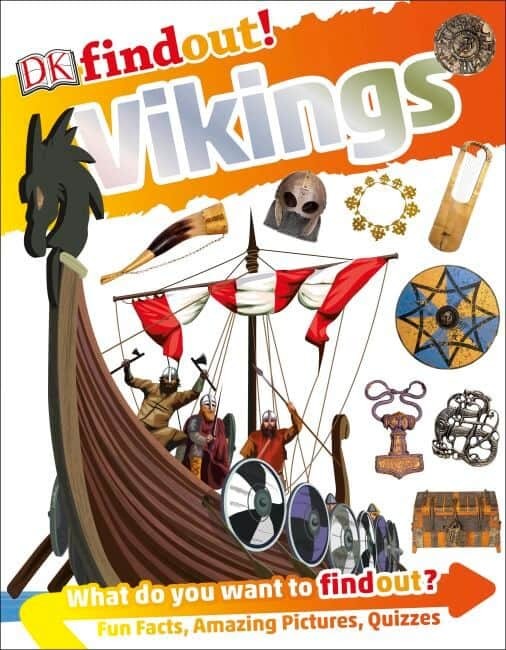 Children will learn about the most famous Vikings, their homeland, longships, warriors, and their ill-gotten gains. You’ll get to peek inside a Viking home, see how they dressed, the food they ate, the games they played, their gods and goddesses and their beliefs about the afterlife. Ancient Egypt is a topic that will never get old. Kids will be amazed as they learn about the Pharaohs, mummies, pyramids, tombs and hieroglyphics. Take peek into the Egyptian empire and everyday society. Learn how pyramids were made, how bodies were mummified and the book of the dead. The Egyptians will also share their favorite garments and some beauty tips. Did you know that some Egyptians used razors to shave off their real hair and then wear wigs? This book is filled with a plethora of interesting facts and amazing images. Secret code: Nefertiti. 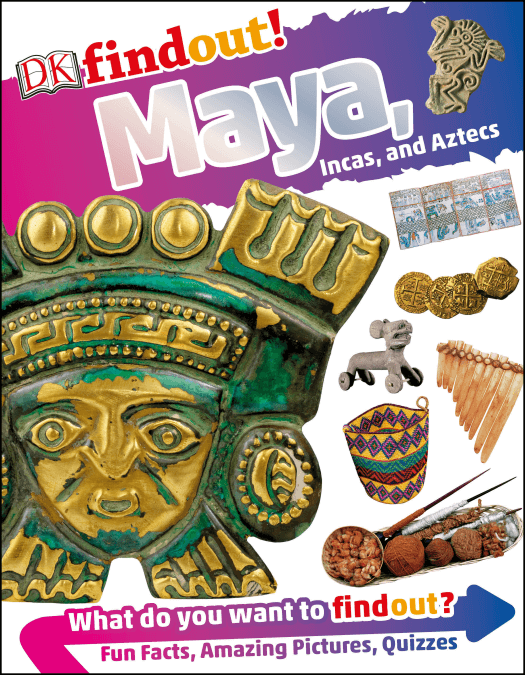 Kids will be mesmerized as they step back in time to learn about three ancient civilizations, the Maya, Incas and Aztecs. As kids explore each civilization’s ancient city, they’ll get a perspective of how they lived, their gods, ceremonies, art and pottery, their unique written language and numbers, medicine, treasures, calendars and even sports. Did you know that the Mayans used glyphs to name each day on the calendar and believe that the world started again every 5,130 years? Guess who invented hot chocolate? Nearly every family has a child that eats, breathes and sleeps dinosaurs. The DK Findout Dinosaurs book will expand the knowledge of dinosaur fans and prehistoric fact-seekers. Kids will learn about the different kinds of dinosaurs, how big they were, fossils, their environment, where they lived, their eggs, their colors, which ones had feathers and which swam the oceans. Did you know that the Troodon was deemed the smartest dinosaur because it had the largest brain? Or did you know that in 2006, a new dinosaur was named Dracorex Hogwartsia which means dragon king of Hogwarts? This is an awesome resource book that kids will find hard to put down. Disclaimer: I received products to facilitate a review. All opinions are my own, yours may differ. I loved the DK Encyclopedias when I was a kid, although I no longer have any. I think it would be great to pass this tradition on to my little nephew! Would love to win the dinosaur one for my 6 year old grandson. He has loved dinosaurs since he was very young and can name almost all of them. I love the details DK includes in their books! The pictures are acurate informative and the text is carefully worded. All of these specific books would benefit our household. So much interest in each of the subjects. Not to mention how awesome they are just as they are these books. Love the DK encyclopedias. Perfect for our unschooling home. I want to win this because I love learning books. I would love to win this so my son can learn many new things! My granddaughter loves DK books as she enjoys learning new facts. I would absolutely love to win these for my little cousins. They would be so fascinated by all of these encyclopedias. They are all my little smarty-pants. I would love to win this prize because my daughters would absolutely love these books! They love to read and they love to research! DK books are so great!! DK Encyclopedias are so informative and entertaining. My nephew Wilson is really into Dinosaurs and would love it if I win this book for him. My granddaughters love learning and books! Thanks! I’d love to win the DK encyclopedia books because they are awesome full of accurate information and pictures that is inspiring and internet for kids! I would like to win this because I think my son would really like it. Perfect for my niece & nephew. I would love to win this for my Grandchildren. There’s not a better gift than the gift of knowledge. Thanks for the oppurtunity! This would be an excellent gift for my nephew and niece. They love books! These DK learning books would be perfect for my curious grandsons. My grandchildren would love all these books. My 9 year old son would love these! These books look both beautiful and interesting as well. I would love to have them to share with my grandchildren when they come visit me. I am a special education teacher and I would love to win this!!! I have a very curious granddaughter and I would love to share this with her. I have 3 very inquisitive grandsons who would love these books ! I want to win this prize to read with my little man! Want to help teach my grandchildren. My daughter and nephew both love books with FACTS, and these would be perfect for them! I would like to win this for my son to enjoy. He loves to read. I want to win this prize for our Granddaughter. I’d love to win because my kids would love to read these! I would like to win these books for my grandkids. I would really love to win these for my cousin so she can practice her reading. I’m currently pregnant with my first and building a library for him. I’ve always loved learning and read everything I could get my hands on; want to pass that curiosity and passion on! I’d love to share these with my nephews. My son loves dinosaurs and would enjoy this book. I would love to win this set for my grandkids, who just turned 5 and 7 this week. I like my girls to read books that are fun but help them learn as well. Great material for kids. Dinosaurs are great! I would love to win the DK Findout Encyclopedias for Kids Prize Pk for my grandson, he loves to read. My grandson would enjoy these books. I love to win for my nephews. They love books and learning. love to win to read and share with the grandkids! Great books! Having books like these around encourage learning so I would love to gift them to my grandchildren who are always so inquisitive. MY GRANDSON LOVES TO READNEED THIS!!!! What an awesome prize to win for the grandkids. My child is just the right age to get so much out of this! I’d like to win this for my kids. We love DK books and these look really interesting. I would love to get the dinosaur book for my BFF’s youngest son. He is a paleontologist in training at only 8 years old and can name every species by seeing the picture! My daughter loves non fiction books and DK books are so informative. My oldest daughter would love this! I have passed on my love of books to my 2 year old grandson, Carter Shae. I’d love to win this for my granddaughter for when she gets older. I would be absolutely excited to win this. I would love to read these to my daughter. I would love to win this prize pack for my son – he loves books! I think he’d love the dinosaur book the best. Thanks for the chance to win! I think my kids would really enjoy these books. Hope to win for them. I want to win this for my little library that kids from my neighborhood can enjoy.